﻿ Email Copywriting 101: A Helpful Guide » Red Mango Marketing! « April 2019: What’s New with Constant Contact? You know email marketing is an effective way to connect and communicate with your existing and potential customers — but how do you maximize it? Writing an email that’s as fresh as the spring season, takes time, creativity, and practice. To create a consistent brand tone, every email you send must look and feel the same but the challenge is making an individual email stand out and deliver the right message. How do you get email copywriting right? How do you telegraph a message simply, yet effectively? How do you come up with strong email copy each time? How do you look for new and relevant email campaign ideas? Every email must drive the reader to take a specific action. Your email might promote your products and services, offer a discount code to boost sales, share valuable product or industry information, ask for feedback, or simply remind them to renew subscriptions. Once you have identified the objective for your email, you can start thinking about what you want to say. Ask yourself the three key communication questions to help outline your copy: What are you offering? Why should the recipient care? What should they do next? Once you have the answers, you are ready to create an effective email that drives action. Ready to get started? Let’s dive deeper into the key elements that make email copywriting impactful. Chances are that you have sent emails that have gotten lost, ignored, or even moved to trash in your customer’s inbox. This happens when your subject lines are not as creative and relevant as the message inside. A good email subject line is probably the most important element of your email copy. It’s the first thing your customers will see in their inbox and is what compels them to or dissuades them from opening the email. This is where you need to focus your creativity to generate interest and pique curiosity. A subject line should be crisp, around 4-7 words. It can be phrased in the form of a question, be funny or whimsical, or give a sneak peek into what’s in the email. Imagine you run a bakery. You use email marketing to showcase new products, share baking information, get RSVPs for in-store events, and share discount codes to entice your customers. Your subject lines need to stand out and tell the customer at first glance what they can expect inside. Preheader is the short line of text you see in your inbox, below a subject line, before you open the email. Think of the preheader as an extension of your subject line. You can increase the excitement, or curiosity generated by the subject line through the preheader text. The preheader text must be between 6-12 words to ensure that the complete message is displayed on all devices. So while the subject line teases the reader, the preheader text gives a little more information about the purpose of the email. What are you offering? (Headline) Is it a discount coupon, a new line of products, an event you are that you are hosting? The answer to this question becomes the headline for the body copy. State clearly what your business has to offer. Put it right on top, in bold, with the font slightly bigger than the other text. Keep it 6-7 words to best set the tone for the message body. How will it help the reader? (Message Body) Below your headline, write a few sentences to elaborate on your offer. Provide important details and explain why they matter to your reader. Sometimes, customers need that little push to make a decision. Will they get free shipping if they order right now, will it make some daily activity easier? Keep your message clear and concise. 15-20 lines are all you need to write a powerful email. If you need to share more information, break it up into 2-3 small paragraphs, or bullet points to make it easy to read. What should they do next (Calls to action) Tell the reader what they should do next. Do you want them to go buy a product you are offering, register for an event, read a new blog or share their feedback? Choose a bold, simple and direct phrase like, “Buy now,” “Register now,” or “Reserve a spot for me.” Keep the text simple, and easy to understand. Then, put it into a button that links directly to the relevant website or product page. Place the button in a prominent position so that your readers know exactly where to click. Message Body: Make sure you don’t miss out on this limited time offer, home delivered, perfect for Spring parties, snacks, and special occasions. The best email marketing campaigns are those that are well planned. Planning includes creating an email marketing calendar in advance and scheduling which emails you will send, and when. Then you can invest time in thinking about each email, and the message you want it to deliver. With proper planning, you can create engaging emails in no time. Design factors like font style, font size, amount of white-space, and placement of copy blocks directly affect an email’s readability. You want the email copy to be easy-on-the-eye, clutter free and well placed within your email template to drive attention to your call-to-action. A/B testing allows you to create two versions of your email, and send it out to a small subset of your email list. You then identify the ‘winning email’, the one that performed better, and send it out to the remaining contacts. This approach ensures that you are always sending your most impactful messages in your marketing campaigns. You can start by A/B testing the subject line, and once you get that right, begin iterating on other components one by one in an effort to increase your engagement metrics and conversion rates. To err is human, but the last thing you want to do is send out emails with mistakes. Preview your email content and check for grammatical errors, spelling errors, and proper punctuation. You must also ensure that all the links you included are working, and discount codes are functioning. Before you send an email to your customers send it to a few people in your team, or to your friends to ensure everything is perfect. Test the email on different devices to make sure that the images, content, and links are working fine for all. Now you are ready to hit send! Great copywriting is indeed an art; one that you can master with the right techniques and practice. Focusing on being creative, crisp and consistent is the best way to create, and send compelling and engaging marketing emails. Don’t get overwhelmed with the thought of writing out the entire email at once. Divide the work up into small chunks Tell your audience what you have to offer, the benefits or advantages and why they should care, and the specific action you want them to take next. Following this simple formula will make copywriting a breeze. You can now create a variety of powerful emails to support any of your marketing objectives, and stay out of the deleted folder. Ready to start writing strong marketing emails, and inspire action? 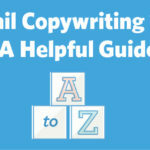 The post Email Copywriting 101: A Helpful Guide appeared first on Constant Contact Blogs. This entry was posted on Wednesday, April 10th, 2019 at 1:02 pm	and is filed under Email Marketing, News & Updates. You can follow any responses to this entry through the RSS 2.0 feed. Both comments and pings are currently closed.